You can come to my Lake do a search for Minnesota fish ins here in the forums you can see its a pretty good lake. Two fellow fisherman one who is flying in from England are coming to fish with me Friday. You are welcome to join us. Brian, the guy from England is a very knowledgeable carp angler. Its Lake Marion in Brownton. Shoot me an email or PM if you want details. We caught the biggest fish of the year last fall here in my lake. Health and work have prevented me from fishing since August. I pre baited today and am going to fish this afternoon I'll let you know how it goes. The water levels have gone down so I'm hopeful. I understand. Difference between member and director I guess it seems to me. And since you are paid or get free gear from sponsors posting reviews of their gear seems ......... But if the majority of the membership has no problems with it than I don't either. ONE, but they were fishing in Michigan. I wasn't aware of the roaming gangs of night toughs assaulting fisherman in the cities ? I mean unless Korda is a paying advertiser? Otherwise it seems like a conflict of interest for the CAG Director to post reviews of products from his sponsors. Aren't you sponsored by Korda? Aniq was a cat fisherman before he discovered carp I believe so he might know some spots. No I can't saving pennies for the wedding. I thought jaffar took the title from you last time? I bet jaffar catches the most bullheads! So I'm a nice guy I volunteered to host a fish in. I fed everyone BBQ. They all get food poisoning and die. But hey I'm a nice guy and I volunteered so I'm not really responsible for it right??? Just because someone volunteers they shouldn't not be held accountable for a piss poor job. Perhaps the membership, you know the people who pay to be members should vote on which things volunteers can handle and on which things should be done by paid professionals??? You know like screwing up the forums. Trust me in the end that's gonna cost you way more in lost membership fees than paying to have it done right. Baloney, I've been thru the upgrading of some of the forums I am in before some 2 or 3 times and never was the forums screwed up like ours was. The loss of years of data, is inexcusable. Some of the members who contributed that stuff are either dead or have moved on because of all the BS. All that knowledge is GONE. Perhaps you should have spent some of that money we all paid to be a member to have a professional do the upgrade/changes. Sorry but you and whoever else was involved will get no thanks from me for doing a piss poor job of it. Did you check Mudhole tackle they seem to have everything. I prefer full cork handles FYI. Careful with boilies in my experience you have to "teach" the carp what boilies are if they haven't been exposed to them before. This isn't Europe so most wild carp haven't seen or eaten them before. Stick to corn or fake corn and a method feeder (oats and cream corn are easy and effective) to start. When you find spots with Carp that you want to keep coming back to start throwing boilies in when chumming. 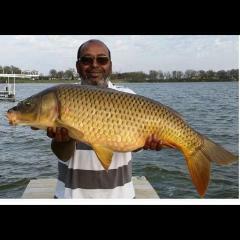 After a while they will start recognizing boilies as food and you can fish with them. Not saying you can't use boilies right off. If they on a feed they'll eat anything. But in my lakes boilies didn't really start working for me until I'd kept throwing in a couple spoonfuls every couple of days for a couple of weeks. In my backyard lake I often just fish with a boilie and no method/pack bait now and catch. But I still throw some out everyday I'm there. For me I feel boilies catch bigger fish on avg and I have cats and bullheads in my lakes they tend to take my bait less when it's boilies than corn. In one of the lakes I fish I will catch more with corn but at this point I prefer to chase monsters over number caught. But when they aren't biting on boilies I will always try corn. At my home lake it hasn't made a difference since I think I've worked really hard at getting them used to boilies as a food source that if they aren't taking them they aren't taking anything. But on other lakes it has made a difference.